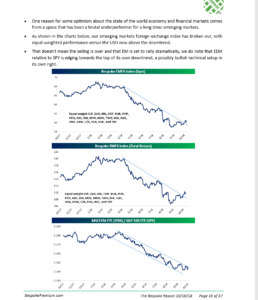 Bespoke – in their weekly Research Report – published every Friday night, had a great graph on what could be a potential bottoming in Emerging Markets the last few weeks. This blog has written previously about Emerging Markets and Non-US (here and here, and here). Brazil (EWZ) was never repurchased for clients, but the EEM and VWO have been added to in small increments during the 3rd quarter, while a new mutual fund was added to client accounts, i.e. David Herro’s Oakmark International Fund. David has an impressive long-term track record, even though the fund is down 15% – 16% YTD as of Friday, 10/19/18. Both the VWO and EEM were / are also down 15% YTD as of last Friday. There has been a further flush in EM and non-US just since September 30th, when all three vehicles were down only down 7- 8% for the first 9 months of the year. What’s the proper weight in client accounts for EM and non-US ? No doubt that varies depending on who you ask, but Emerging Market economies are about 15% of global GDP, with China being the largest share of that chunk. Chinese shares or China ETF’s will never be bought for clients directly. The 10-year bear market in the emerging market asset class ended in Q1 ’16. The three-year rolling return for the EEM is 5.5% and the 5-year rolling return for the EEM is just 29 bp’s. If the dollar just remains stable and the US – China tariff spat could get resolved, I suspect it would break the EM and non-US open quickly, at a time when everyone is worried about the US market. Here is the first-ever EM purchase for clients in March, 2016. It’s (EM trading action, that is) is really all about China. China rose 4% last night. The above mentioned positions will continue to be added for clients in small positions over the 4th quarter.